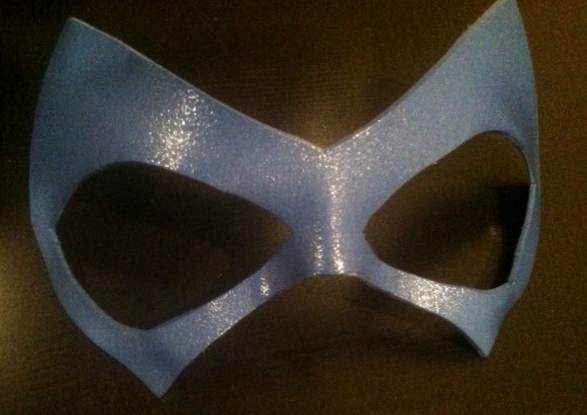 A good superhero mask can make or break a costume, whether it’s for a kid’s party, Halloween, or a convention. I use a very simple method to create my superhero masks, and with a few craft supplies and household items, you can create your own mask that will look great and be easy on your wallet! – Craft Foam – Packs run about $7 and individual sheets around $1. – Styrofoam Wig Head – Found online or at wig shops for about $2 – $4. Step 1: Decide what color and shape of mask you want. Get craft foam of the correct color (or as close as possible) and start sketching your shape lightly in pencil. The side you draw on will eventually become the back side of your mask, so don’t worry about erasing mistakes perfectly. I use an Xacto knife or razor blade to cut my masks out because it’s easier to get smooth edges on the foam. To insure that my masks are symmetrical, I usually draw one side, cut out almost all of it, then fold it over and trace it to make the other half of the mask. 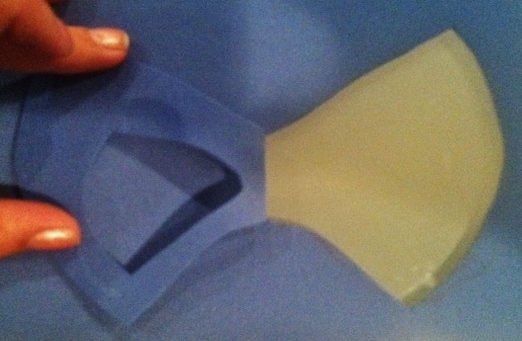 Step 2: Molding the foam mask to fit the contours of your face is very easy! Start by taping the mask in place on the foam wig head, making sure that the side with pencil marks becomes the back. Don’t use pins because they can leave holes in the foam or will melt it if they heat up during this process. The tape might lose its grip if it gets too hot, but it will keep the mask in place for the beginning of the process. Using a heat gun or a very hot hair dryer, start heating up the foam mask and gently pressing the mask into place. Be careful not to burn your finger or start melting the foam, especially if you are using a heat gun. If you smell something burning, STOP! I find that it works better to start in the middle of the mask near the nose since that area takes the most shaping, then move to the outer areas of the mask. Once you have the shape you like, let the mask cool completely before moving on to the next step. 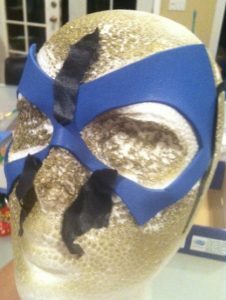 Step 3: If your mask is already the correct color, move on to step four, but if the foam is not the right color now is the time to paint your mask. Leave it on the Styrofoam head, re-taping it so that the tape is on the back of the mask only. 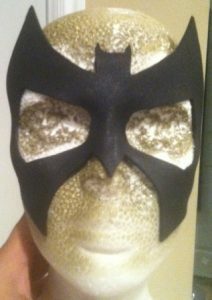 Then carefully spray paint or paint the mask by hand. It’s important to keep the mask on the head during this phase so that it keeps its new shape. I highly recommend testing your paint on a scrap of foam first because some paints will damage/melt foam. You will notice how messed up my Styrofoam head is in the pictures! Step 4: After your mask is completely cooled and the paint is TOTALLY dry, you will seal your mask with a clear coat of Mod Podge. I usually use the spray on variety, which is available at craft stores, Wal-Mart and other places, but brushing it on can work as well. MAKE SURE THAT YOUR MASK IS STILL ON THE STYROFOAM HEAD WHEN YOU DO THIS and that the tape is attached to the back side. The Mod Podge will give your foam a shiny look and texture that resembles latex or leather. 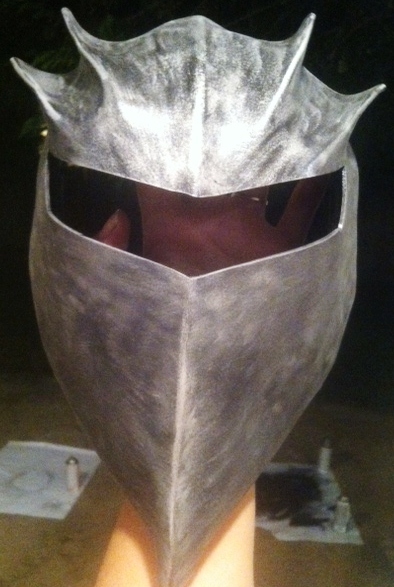 I recommend multiple coats of Mod Podge to give your mask more strength and to help it keep its shape. Let each coat dry completely before adding the next and leave the mask on the Styrofoam head for at least 24 hours after the last coat. Step 5: There are many methods to wear your new mask. You can punch holes on the sides of the mask and tie ribbon or string to it, then tie it behind your head. For the “superhero” look, I usually use spirit gum to attach it directly to my face. Spirit gum is pretty cheap and available at most costume stores. Be sure to buy it in a pack with the spirit gum remover. Trust me on that. I learned the hard way. I also recommend testing it out on a small spot on your before the event, just in case it irritates your skin. You don’t want to show up to work on Monday with a raccoon mask rash! This technique seems simple, but it can create amazing things! With practice, patience, and a little creativity, you will be able to create incredible masks and finish off even the most professional costumes! Many people have MUCH broader noses than that though (e.g. many people of east-Asian or African descent), or in the case of many of east-Asian descent, shallower nose bridges, too. So the molding of the shape around this might not work for everyone, at least without some sort of tweak to the Styrofoam? But I’m not sure how one would do that. Lightweight air-dry clay maybe? : Or carving/filing down, in the case of a shallower nose bridge? I think I remember professional SFX people literally making a latex or silicone mold of their actor/model’s face as part of the process when watching that show where they pit SFX competitors against each other, but don’t quote me on it >_> It would make sense, but it also would be a lot more labor-intensive and a lot less cheap. What a great tutorial. I’ll admit, I was never one for dressing up, but now I myself want to try this. I have a friend who likes to create Cosplay costumes, so I’ll definitely be directing her to your website. Great job! It’s about practice. Try picking out a mask in a comic that you like, then drawing it on paper. Be sure to leave enough space around your eye before you get to the mask. That helps to make it look more flattering. This is a great tutorial! I may need to use it in the future. 🙂 Another way to stick things to your face, especially lightweight things, is with “fashion tape,” the double-sided tape designed for holding down bits of clothing to skin. I’ve used it to stick small mask bits to my face.